To the side of a roundabout in Mérignac, not far from junction 10 of the Rocade ringroad, a flame-shaped marble plaque is the sole reminder of what was once located there or thereabouts: Mérignac-Beaudésert internment camp. The Beaudésert district, after playing a leading role in the birth of aviation in the area, had formed the backdrop to a 20,000-bed hospital set up by the US Army during the First World War. Then, throughout the 1920s, the surrounding area had been earmarked by the local authorities for an “Olympic”-style village with sports fields, tennis courts, swimming pool and skating rink. The ambitious plans were soon shelved though and the area instead became occupied by the traveller community... whose immediate environment was about to change radically. viewed from the middle of the neighbouring roundabout. Ever since 1912 and the classification of Roma as a population category in their own right (“nomades”), anti-Gypsy resentment had gradually escalated throughout France. In 1938, a decree was passed to create detention centres for such “undesirable foreigners” and so it was that on November 17th 1940, in now-occupied France, the Mérignac “Centre de Séjour Surveillé” was officially opened by French authorities here in the Beaudésert quarter. The camp was initially made up of seven sets of barracks: three were the living and sleeping quarters of the detainees, one was for guards and officers, while the others comprised the refectory, an infirmary and kitchens. From March of 1941, political prisoners held in central Bordeaux were also transferred to the camp, which was subsequently extended to become a 32-barrack structure with a capacity of 500-600 detainees. They were soon joined by other communities such as Jews, Spanish Republicans, members of the Résistance, black market traffickers and prostitutes, along with individuals who refused to comply with the Nazis’ forced labour policy (or "STO", Service du travail obligatoire, as referred to on the plaque). By now Beaudésert was officially an internment camp (under the authority of the French Interior Ministry and the Gironde Préfecture), was surrounded by impenetrably tall fences topped off with barbed wire, and divided into two distinct sections, one for Jews, the other for further hostages and political prisoners. 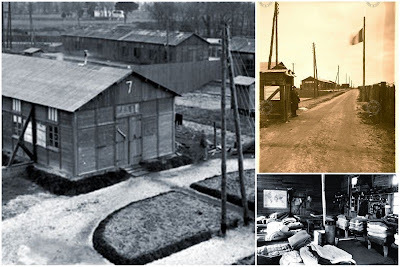 Rare pictures of the camp, sources: Archives départementales de la Gironde and romafacts.uni-graz.at. For many of those held by the French authorities at Beaudésert, the mercilessly cruel and atrocious conditions became a harrowing prelude to what awaited them elsewhere. In October 1941, 50 of the Beaudésert political prisoners, patriots who had been arrested in 1939 because of communist activities, were transferred to Camp de Souge in Martignas-sur-Jalle, in retaliation for the murder of military officer Hans Reimers in Bordeaux by a communist activist. They were immediately executed by a firing squad. In all, 300 people were executed at Camp de Souge and many had been detained at Beaudésert before being handed over to the Germans. On July 15 1942, 70 Jews were arrested throughout Gironde and led to Beaudésert. 46 were detained at the camp although their stay proved to be short. Just two days later they were among the 171 Jews sent first to the internment camp in Drancy, to the north of Paris, and then deported to Auschwitz. Elder prisoners and 57 children were among the 443 Jews similarly deported on August 26 1942. A further eight convoys were to depart from Bordeaux up until July 1944. In total, of the 1,500 French Jews to be deported from the city, 800 passed through Beaudésert. It is estimated that only 10 returned from Nazi death camps. After the end of the War, the camp remained open but instead became a detention centre for collaborators and later illegal immigrants. In 1948, the camp’s purpose changed completely and it became a haven for the homeless, who turned the camp into a veritable village. But the living quarters rapidly fell into disrepair and by 1957 its inhabitants had deserted it. The camp was totally dismantled and, ever since, the area has gradually developed into the ringroad-side industrial estate that can be seen today. A McDonald's fast-food restaurant is the latest addition to the area where the camp is thought to have been located. The Rocade ringroad around junction 10. Over the following years, the camp was regarded as such an inconvenient chapter in local history that it was virtually wiped from collective memory. When the memorial was erected in 1985, it was positioned at a point believed to be towards the middle of the camp, according to the geographical estimates of some trusted elder members of the Mérignac community. Incredible as it sounds, no-one knows for sure precisely where the camp was located! Exact figures as to how many were held at Beaudésert during the wartime period are difficult to come by. Some sources put the figure at 4,000, others estimate it may have been twice that number. The 1985 monument refers instead to the 1,200 “Resistants, political prisoners and Jews” who lost their lives either at Camp de Souge or subsequent to the forced stay at Camp de Drancy. Sadly, the original inscription omitted one community, namely the original reluctant tenants of the camp: Roma or “Tsiganes”. Yet in January 1943, 70 travellers, half of whom were held at Beaudésert, were sent to Royallieu camp in Compiègne, to the north of Paris, ahead of being deported to Sachsenhausen concentration camp. This omission was rectified in 2005 and the word “Tsiganes” was added to the plaque, inserted where just enough space could be found between the first and second lines. The gesture was a highly symbolic one, but the omission remains an open wound for members of the Roma community, the forgotten victims of an important wartime chapter which has itself almost been erased from history. > Find it on the Invisible Bordeaux map: Beaudésert internment camp memorial, Rue des Châtaigniers, Mérignac.